For the first time, scientists have observed a mini magnetosphere on the moon—a magnetic field "bubble" that protects part of the lunar surface from punishing solar radiation. This mini magnetosphere lies near the moon's equator, where sunlight reaches only half the time. This would limit the power available to charge solar arrays, should humans ever return to the moon. But there's evidence other magnetospheres might lie in more favorable landing sites, offering some radiation protection for astronauts. Earth is fully enveloped in its magnetosphere, because our planet's solid iron inner core rotates inside a molten outer core, creating a magnetic dynamo that generates a global magnetic field. Extending up to 52,000 miles (78,000 kilometers) above the surface, Earth's magnetic field traps and redirects the constant stream of charged particles from the sun, aka the solar wind, which could otherwise fry life as we know it. Sometimes, when a burst of solar activity overloads Earth's magnetosphere, charged particles seep through and interact with our atmosphere. "I live far north and can look up and see the [resulting] aurorae," said study co-author Martin Wieser, a senior scientist at the Swedish Institute of Space Physics. By contrast, the moon doesn't have a global magnetic field, so its surface is constantly being bombarded by the sun's charged particles. But new data from India's Chandrayaan-1 lunar probe have confirmed that the moon does have a miniature version of a magnetosphere covering a small pocket in the northeastern region of the side of the moon that faces away from Earth. When Wieser and his team measured it in June, the moon's mini magnetosphere was 224 miles (360 kilometers) across. The magnetosphere acts like a stone in a stream, causing the solar wind to move faster and get thicker in a 186-mile (300-kilometer) ring around the obstacle. The magnetic field at the center of the bubble is 300 times weaker than the section of Earth's magnetic field over the Equator and 600 times weaker than the field over Earth's Poles. Magnetic Anomalies Paint Moon's Bright Swirls? The origins of the mini magnetosphere are puzzling, although some scientists have noted that magnetic fields tend to appear on the opposite side of the moon from large impact craters. "There is a theory that links the two facts: Plasma [charged gas] created on a large impact would flow around the moon and freeze in the magnetic field when the plasma wave meets on the other side of the moon," Wieser said in an email. Previous observations had hinted that mini magnetospheres might exist on the moon, but the Chandrayaan-1 data showed the effect much more clearly. That's because the probe was able to "see" the behavior of particles much closer to the moon's surface. 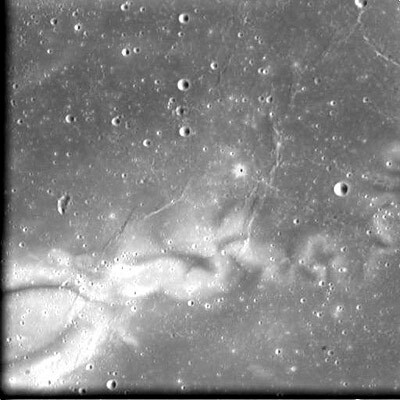 Similar mini magnetospheres elsewhere on the moon could explain mysterious bright "swirls" on the lunar surface, Wieser said (see picture above). Solar radiation hitting the lunar soil darkens the surface over time, but magnetospheres might be protecting such regions from this dimming effect. Most asteroids would be dwarfed by even a mini magnetosphere, Wieser said, so "they will be completely inside such a magnetospheric bubble. If the field is strong enough, this could alter significantly how the asteroid evolves." Understanding asteroid evolution can in turn tell us more about the birth of the solar system, he pointed out. Asteroids lack atmospheres and therefore are not subject to most of the erosive processes that alter evidence of geologic histories on other bodies. "These objects are thus thought to be much closer to how the solar system was in the beginning," he said. Knowing the effects of solar wind on asteroids and how magnetic anomalies might play a role will be an important link in the story. "Any process modifying the surface over geological times may significantly change our understanding of these objects ... and may therefore change our understanding of the formation and evolution of the solar system," Wieser said. The moon's mini magnetosphere is described in the March 2010 issue of the journal Geophysical Research Letters. The Reiner Gamma Formation, a totally flat area consisting of much brighter material than the surrounding dark 'mare', is centred on an area located at 57.8° West, 8.1° North, in the Oceanus Procellarum on the near (visible) side of the Moon, and has an extension of approximately 30 by 60 kilometres. The feature was initially misinterpreted as a crater. Later observations from orbit have shown that the observed swirl-like patterns do not correspond to any topographic features, but they are the result of an optical anomaly whose origin is still unclear.